We also have a really nice variety of plants in there — lilies (the lily pads always make me think that we should have a few frogs), parrot’s feather, water celery, and many more. I think I drive Renee a little nuts sometimes because I’m always forgetting the names of the plants and asking her what they are — usually when her mind is busy on some project or another so she can’t remember. Anyway, the fish can actually hunker down and live through the winter as long as we keep the water filter running. The top of the pond freezes up, and long icicles form around the filter / waterfall, but the pond is deep enough that the fish can semi-hibernate and make it through the winter. We do have to keep the water level up; I find it a little odd to be out there with the hose topping it off in the middle of January! The plants, on the other hand, cannot survive the winter. In past years, Renee just bought new ones every spring to restock it. This year in particular we ordered a few varieties online because PetSmart stopped stocking them. Several of these plants are tropical or semi-tropical, so they don’t much care for Montana winters. 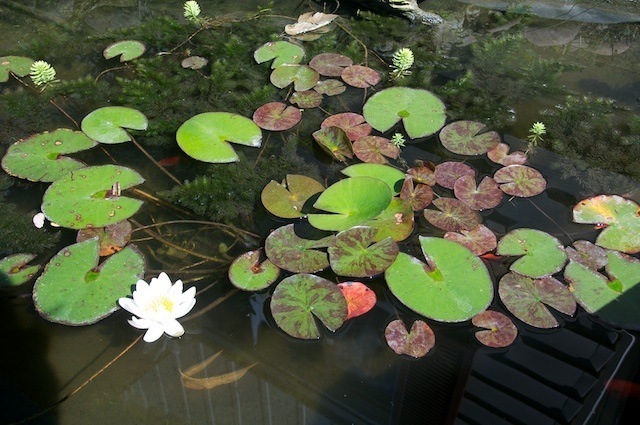 Last year, we came up with a plan to save some of our pond plants over the winter in the greenhouse area. This is the little extra room back behind the cats’ apartment that has semi-transparent roofing and walls to let in lots of light. 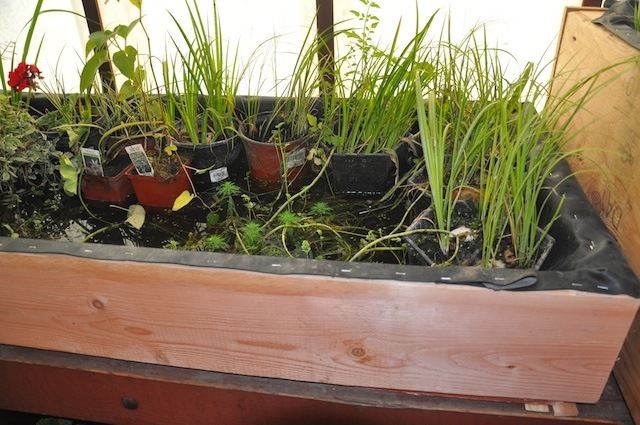 It was a fairly simple setup: two large plastic tubs (one taller than the other) full of water in the greenhouse area. But the water needs to circulate, since sitting in stagnant water would not be good for the plants. So one chilly evening we ran around to a couple different stores, describing what we were looking for. I should say, Renee described what we were looking for, because she already had a picture in her head of how to set this up. I was just sort of along for the ride. It took trips to both Home Depot and then Quality Supply to find the right-sized pipe fitting. We drilled a hole in the larger tub and installed the fitting so that it sort of stuck out over the smaller tub. Then we filled the tubs up with water and used a small pump to send water from the smaller tub back to the larger tub. So the water in the larger tub would drain out into the smaller, then flow back in via the pump. 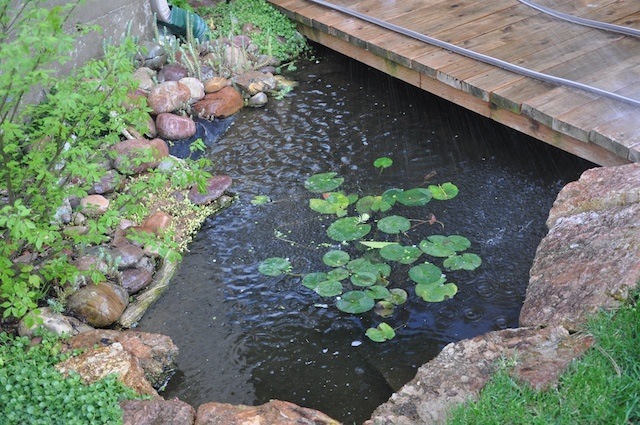 As long as we kept the water levels up, we had a nice little waterfall keeping the water circulating. 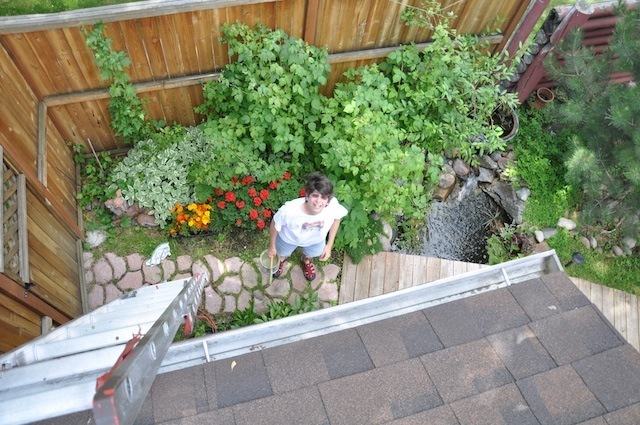 This mostly worked, and in the springtime we moved the plants back into the pond. Not all of them made it, so we still needed to buy more, but at least some of them did survive the winter. We did run into a few problems with this solution. Cheap Plastic Storage Tubs are Not Meant to Store Water! For one, the plastic tubs were not designed to withstand the weight of many gallons of water. The larger tub started to bow out, which over time might have sent water sloshing over the sides. Renee fixed this in a temporary fashion with some scrap wood; she built a sort of rough frame around it to hold it in its original shape. Our other problem happened on November 22. 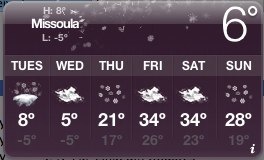 That night, we had cold, cold weather with blizzard-like winds. The next day the weather forecast was for more cold (a high of 8). When we checked on the plants, the water in the tub was all frozen up. We got a small portable heater to warm up the greenhouse (similar to the one we use in the cats’ apartment). This thawed out the frozen water. Some of the plants didn’t make it, but most of the lilies and some of the parrot’s feather did survive. This Year’s Goals: Save Even More! So this year, we wanted to improve on this and hopefully save more of the pond plants and some of the other non-water plants. We already had the heater ready to go, and we had cleared a lot of stuff out of the greenhouse area while working on the cat’s room before. The greenhouse also had the same new roof that the cats have. We had planned on this by using the semi-transparent skylight panels over nearly the entire greenhouse. The panels made it nice and bright in there. 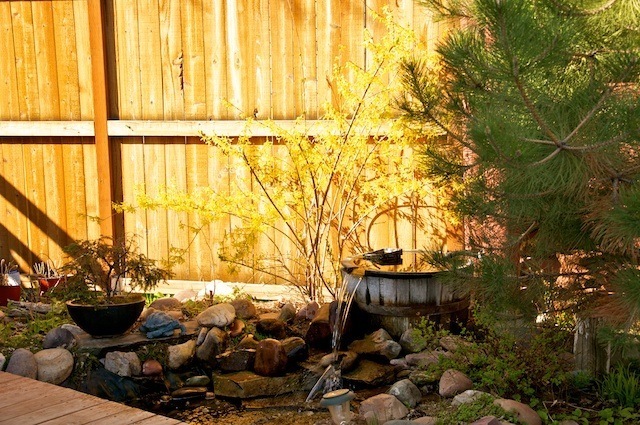 So this year, Renee took indoor pond to the next level and built a great winter home for the pond plants. She used more scrap lumber (although she did have to buy a few 2×8’s) and constructed a nice big wooden box. The box is sized to just fit on the counter in the greenhouse room. In fact, we had to get an extension cord with a flat plug on it to plug in the water filter; she didn’t leave enough room to allow a normal plug to stick out. The next question is, how do you make a wooden box watertight? This part was simpler than I imagined. 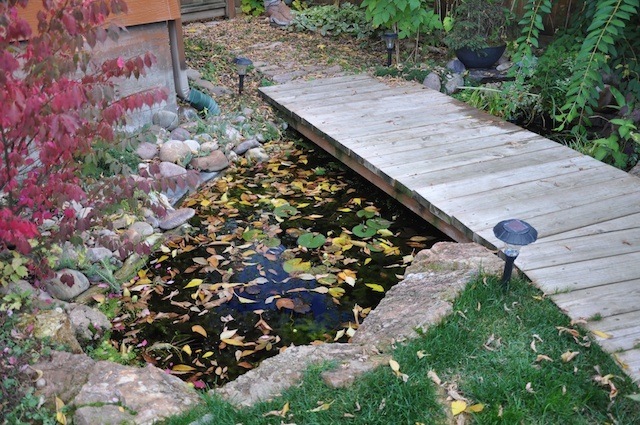 She used a large sheet of pond liner material. This material feels sort of like heavy inner tube material. 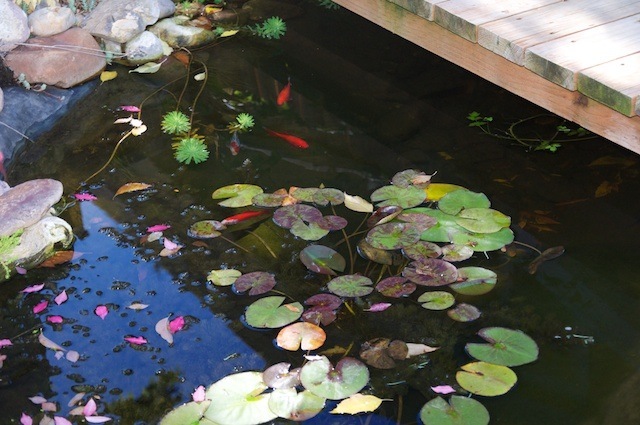 It is the same material you use when you actually construct an outdoor pond. 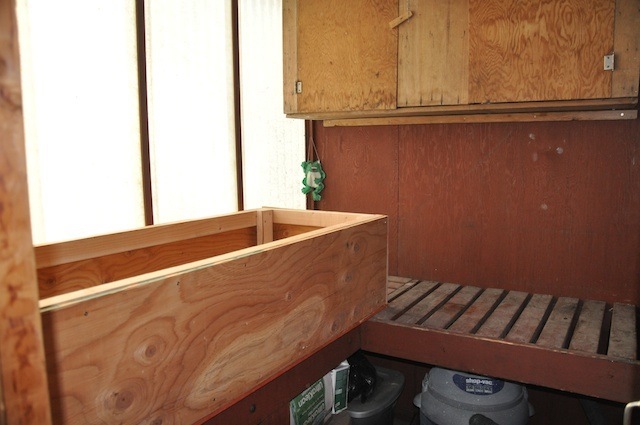 She also added a shelf in the box to elevate some of the plants that prefer shallower water. She setup the filter within the large box so it draws water to one end, sends it back in a hose, and re-enters the box at the other end. Once she started filling this with plants, she realized she needed even more room. So she built a second box for the other counter in the room (the counters form an “L” shape). This one is also a bit shallower. We still need to put in a second filter to circulate the water in this one as well. 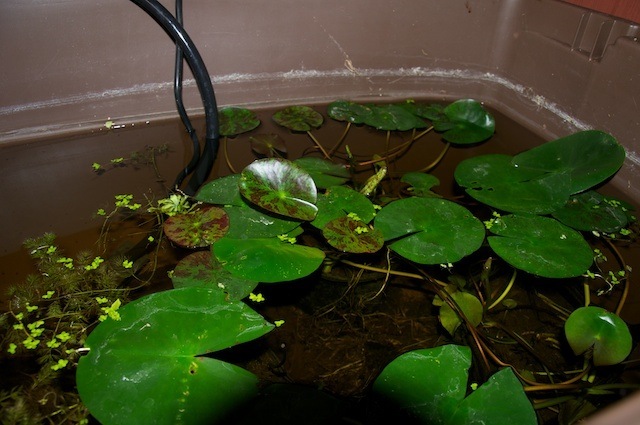 It is now a little crowded in the room, because we have some non-water plants temporarily hanging out on the floor. 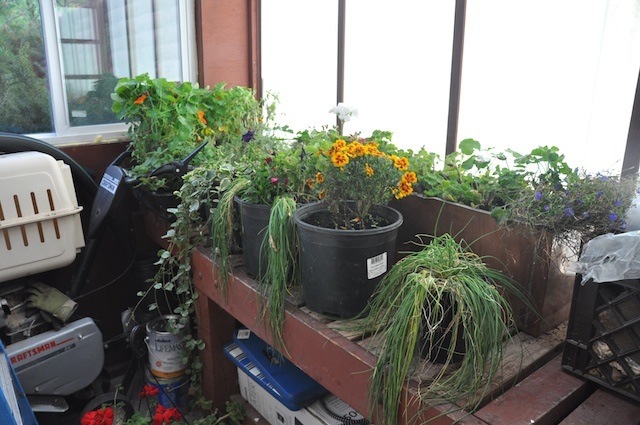 The second room of the greenhouse is also currently crammed full of plants. 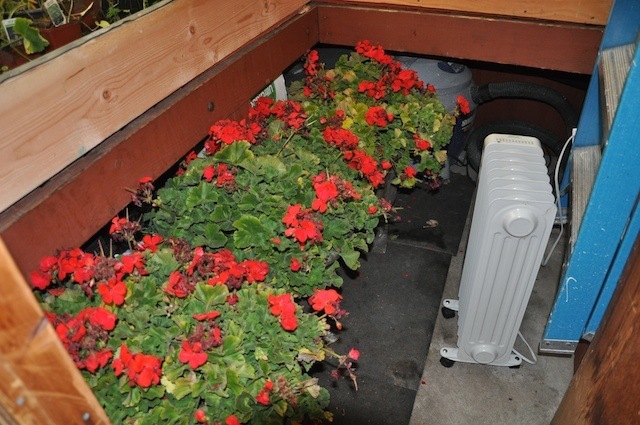 More non-water plants taking up all the room! But, overall, the end result is much nicer than last year. It reminds me a bit of the displays we’ve seen at the pond supply store here in town where we’ve bought plants before. 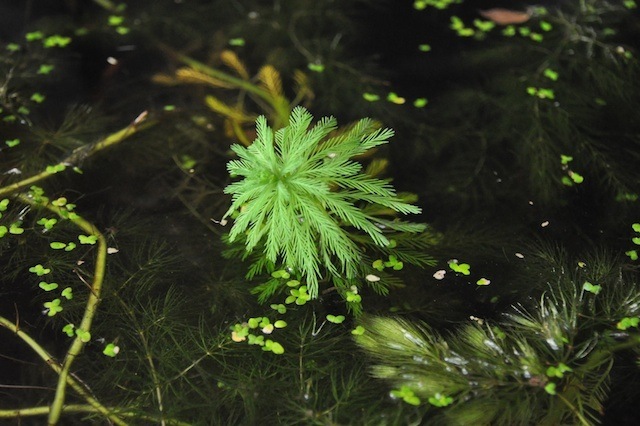 So far, the pond plants look happy in their winter digs. Hopefully this year, more of the plants will survive for “transplanting” back into the pond in the springtime.